That’s what time it was when Bruce Berry’s life changed forever. It was the moment that his son, Brayden, entered the world — a black and blue newborn who fought his way into the world after 12 hours of labor. “He grabbed my finger right away,” Berry said. “I kneeled down and said, ‘Hi Brayden. I’m your daddy.’ He looked at me straight in the eyes. He stopped crying and room fell quiet. I fell in love — and my life was changed. Berry was 23 when Brayden was born, and his path hadn’t been smooth so far. He dropped out of junior high at age of 15; he struggled with drug addiction; and by age 18, Berry was homeless. “When my son and I first made eye contact, my life took an abrupt change,” Berry said. He never wavered from the commitment he made to Brayden to start a new life. This spring, Berry will see that effort come to completion as he graduates with his bachelor’s degree in history from the University of Idaho’s College of Letters, Arts and Social Sciences. Berry’s desire to provide a good life for his son wasn’t without other challenging moments. He was awarded full custody of 2-year-old Brayden in 2010 and found himself living in Coeur d’Alene, Idaho, without a way to support his family. But fate stepped in. Jack Mervin, a health and welfare advocate, introduced Berry to Family Promise, a nonprofit organization that helps homeless people find a place to live, get an education and find work. “My son still thinks that Mervin was an angel,” Berry said. Family Promise gave Berry the support he needed to start making improvements for Brayden, including helping Berry get his GED and flagger certification. “They even helped fix my car and gave us new beds for our first apartment,” he said. Family Promise helped Berry get back on his feet, enabling him to graduate with honors from North Idaho College in Coeur d’Alene, Idaho, in 2016. He then transferred to U of I in Moscow, but paying for school became a challenge. “As a single dad, we struggled to get through summers with the little cash we had,” Berry said. He turned to his advisor and mentor, Department of History Professor and Chair Sean Quinlan, for help. “I told Professor Quinlan my concerns about paying for school, and he simply said, ‘We can help with that,’” Berry said. Berry received the Idaho Opportunity Scholarship, as well as other scholarships, including the Dan Butler Book Scholarship, the Jeffrey Mesenbrink Memorial History Scholarship, the Winkler Memorial History Scholarship and the Susan B. Roberts Scholarship, which specifically supports single parents at U of I.
Berry started his academic career at U of I studying philosophy, but changed to history after taking Quinlan’s “Age of Revolutions in Europe” course. Berry earned a place on the Dean’s List in fall 2017, serves as vice president for the Pre-Law Society and is a member of the history honors society, Phi Alpha Theta. 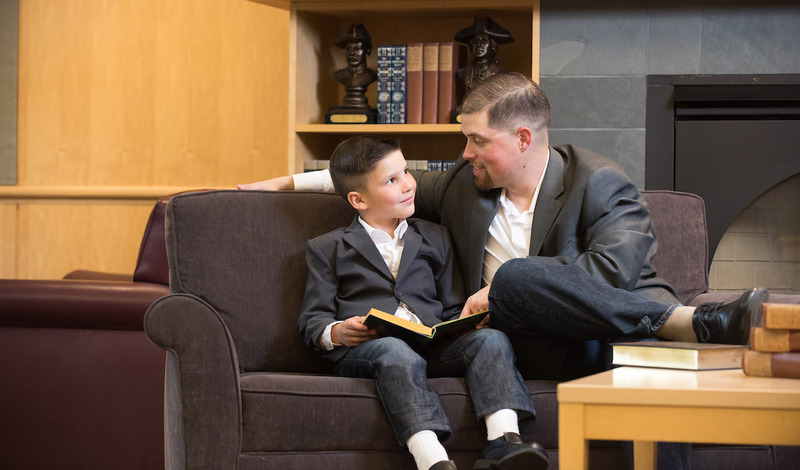 Bruce Berry and son Brayden read books together. Throughout his journey, Berry has found help when the family needed it most. However, he finds his best support system in Brayden, who is now 8. The pair often takes turns doing homework, so that Berry can help Brayden with his school work. After graduating, Berry plans to become a history teacher in the Coeur d’Alene area, so he can have more time with Brayden. Brayden is supportive of his dad’s new plan. “I think that's pretty good,” he said. “My dad is smart, and he will get more time with me."